On the Fourth of July in 1863 — an Independence Day that dawned with twisted, bloated bodies carpeting the fields and orchards of Gettysburg — tens of thousands of Americans who thought themselves numb to violence learned they were wrong. Leafing through the new issue of Harper’s Weekly, they encountered the graphic sight of a shirtless black slave in profile revealing a barbaric web of welts across the canvas of his bare back, testament to a ferocious whipping. A century-and-a-half later, the revolting visual still steals the breath. Now, new research by Bruce Laurie, an emeritus professor of history at the University of Massachusetts Amherst, reveals how the image came about: A pair of Union soldiers from Western Massachusetts who were shocked by the cruelty of slavery they confronted produced the iconic picture in the hopes of making virtual eyewitnesses of those back home. When the photograph went viral, it demonstrated the ability of the visual medium to expose racial injustice and foster social change — long before cellphone videos of fatal police shootings rose to the civil rights forefront. Gere wrote during his time in Louisiana that African-Americans “must be seen” in order “to be fully understood and their condition fully appreciated.” Although he revered the written word as a newspaper publisher, Gere joined many abolitionists in embracing the new wonder of photography as a way to change millions of minds. Twice in April 1863, Gere and Stearns brought Peter to pose for portraits taken by Boston-born photographer William D. McPherson, who was visiting their camp with his assistant. Thanks to recent technological advancements, McPherson was able to cheaply mass-produce Peter’s image on wallet-sized cartes de visite that were printed on cardstock and easier to disseminate than expensive daguerreotypes, which required a fragile glass case for protection. While the soldiers sent copies of the photograph to family and friends in Massachusetts, a third portrait of Peter — likely arranged by Massachusetts medics in the Baton Rouge camp, according to Laurie — circulated through abolitionist social networks before breaking into the mainstream media, including its reproduction in Harper’s Weekly (which misidentified Peter as “Gordon,” according to Laurie). As painful and uncomfortable as Peter’s image was to view, it allowed a mass audience to experience the same transformation as Stearns did on the ground in Louisiana. 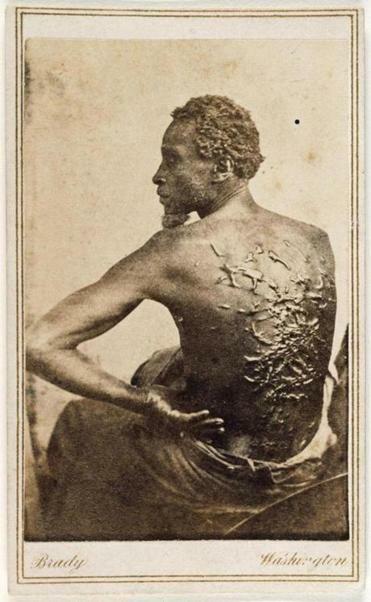 The powerful image conveyed the evils of slavery in a way that even the most potent words of abolitionists William Lloyd Garrison or Harriet Beecher Stowe never could. These days, our hands clutch cellphones instead of cartes de visite. Goodyear says he can’t help but see the parallels between the circulation of Peter’s image and modern-day citizen videos of police shootings that can be disseminated with just a tap on the touchscreen. “What began as a very local — even private — image ultimately achieved something much grander because it circulated so widely,” he says of Peter’s photograph. “When many wished to maintain the status quo, photography provided abolitionists — and more recently other reformers — with a new form of communication that proved very significant in winning support for a political cause. Christopher Klein is the author of “Strong Boy: The Life and Times of John L. Sullivan, America’s First Sports Hero.” E-mail him at chris@christopherklein.com and follow him on Twitter @historyauthor.